Wind and Weather Compass app: insight & download. Instantly get weather, wind speed, and true wind direction for your current location! This app always shows wind direction on a floating compass or a map (click on the compass or map to toggle), and forecast for each hour the next seven days! Wondering which way the wind is blowing? You need this app, download now and follow wind speed, wind direction, and weather live with this app! Whether you are going hiking, biking, kiting, surfing, or setting sail, this app is for you. With this app you will never have to leave your home not knowing what the weather is like. 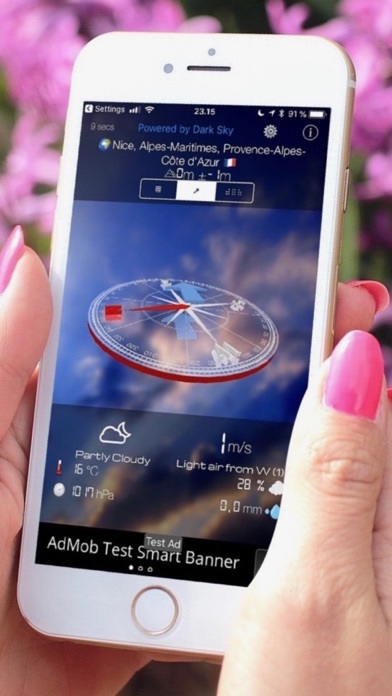 Get instant wind speed and wind direction presented in a beautiful floating compass, along with temperature, pressure, cloud coverage and other weather info for your current location. Useful when you leave your house, or when travelling. The app needs a data connection to get weather data. The app needs gps to determine your position to request weather data for. If you like the app, don't forget to leave a review! Don't hesitate to write an email if you have questions or suggestions to this app. This application requires and collects (only once per weather request) your device's GPS location whose coordinates are sent to the weather data provider to get the weather for your position. Your device's location is sent to Apple to receive (1) name of your location, (2) a map. 23 July 2016 : Free!